Jean Anne Williams Carmean 50 of Richwood, died unexpectedly Thursday April 14, 2016 at the Memorial Hospital in Marysville. She was born September 14, 1965 in Northridge, California to Samuel K. and Nancy Jean (Brown) Williams, her mom survives n Richwood, besides her dad she was also predeceased by her stepson Dalton Carmean. 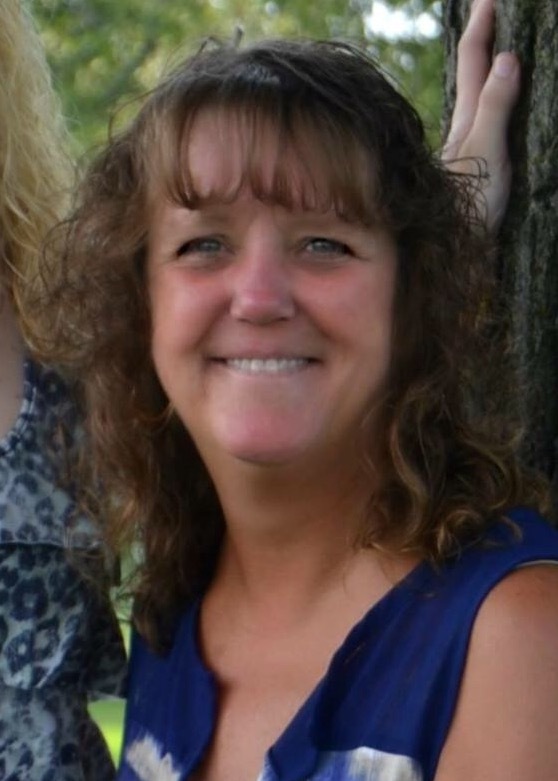 Jean was a 1983 graduate of the North Union High School, she loved Ohio State Basketball, was an avid and talented gardener, she enjoyed cooking, mushroom hunting, karaoke with friends and taking motorcycle rides. Jean was also the bookkeeper for Carmean Repair where she worked alongside of her beloved husband Mike. Jean loved spending time with her family, especially her grandkids. Surviving is her husband Mike Carmean, they were married October 14, 2006 at their home in Richwood, their blended children: Nick Call, Delaware, Joseph (Mikaela) Call, Richwood, Samantha (Adam Wuescher) Call, Richwood, Dillon Carmean, Richwood and Carolyn (Sam Bevis) Carmean, Richwood. Funeral services will be held Saturday April 23, 2016 at 11:00 am at the Stofcheck-Ballinger Funeral Home in Richwood, Pastor Jack Heino will officiate, friends may call Friday from 3-7 pm at the funeral home in Richwood. Private burial will take place in the Claibourne Cemetery. When hearts are breaking, there are no words except we're so sorry. Deepest sympathies and heartfelt prayers. Jean will be greatly missed. So sorry for your loss. Praying that God comfort and keep you at this difficult time. So sorry to hear our prayers to you and your family for comfort at this time. We are very sorry for your loss. There are no right words. We loved Jean. She was such a loving person. Our thoughts and prayers are with you. So sorry for your loss, especially Joe, you grew up with our kids. Our hearts and prayers are with you and your family. Our hearts go out to your family, during this traffic time. We so thought of Jean as a very special person. We cannot even begin to understand what you are going through right now, but we would like to offer our prayers and condolences to you and your family. I am so sorry. Your family will be in m prayers. My deepest condolences to all the family. You will be in my thoughts and prayers. May God comfort you. Thoughts and prayers to you all.God bless you. I am so sorry to hear of the passing your mom. Stay strong through this keep your head up. Thought and prayers are with you and your family at this time. So sorry to hear oh Jean's passing...thoughts & prayers to the entire family! With a very heavy heart we are so sorry about Jean.Words cannot describe how I feel for the family prayers to all. I just don't know what to say. I can't imagine what you are going through. May God's peace find you all. So sorry for your loss. My deepest sympathy and condolences. To all of Jean's family and friends. We are so very sorry to hear of this! Prayers for comfort and peace! My thoughts and prayers to you during this very difficult time. Jean was a very special person. My deepest sympathy! So sorry to hear about Jean. To everyone in the family: we are so devastated to hear the sad news. We can't imagine what you all must be going through. Jean will be greatly missed. Mike, let us know if there is anything at all we can do to help you out. I'm very sorry to hear this sad and unexpected loss. She was good friend and a great person all around. So sorry for your loss. Got to know Jean while working at Scott's Medical. Our prayers are with your family. God be with you in this time of sorrow and the upcoming events to come. Look to God and family, they will not let you down. Love and prayers. Be at piece Jean, you will be sadly missed. My heart goes out to everyone will make an attempt to get over ....... Love to you all and may Gods grace and love shine down on us all in this sorrowful time in which we are in ....... I love you all and know that I'm there with you in thought ......... May Gods love be present ! So sorry to hear of Jean's passing! The Lord and your loving family will be your comfort & strength through this tragic time!! My thoughts are with the entire family. So very sorry for your loss. Our deepest condolences to all the family. So very sorry for your loss. Prayers for comfort during this very difficult time. Jean was a special lady and will be greatly missed. So sorry for your loss. Thoughts and prayers are with all of you. Vickie and Heidi we are so sorry for your loss. Our prayers are with the whole family. My condolences to Jean's Family. She was a beautiful sweet person. So sorry to hear of your loss. Our prayers are with all of you. We are so saddened to hear of the passing of Jean. She had such a zeal for life. You are all in our hearts and prayers. May you feel the comfort of The Lord during this hard time. So very sorry to hear this. I remember fun times with Mike and Jean. RIP sweet lady. I am very sorry for your loss. Prayers for you and your family. Jean will be missed . I wish I had the right words to heal the pain. Hugs and kisses to family and friends . What a beautiful person she was. She was an awesome person, she was my Boss at CompManagement she believed in me a gave me my job. I will never forget the smile on her face and the sound of her laugh! She will truly be missed and never forgotten! Jean was one of the first people we met when we moved to Richwood 14 years ago. We adored her! Always smiling and so funny. Tom loved talking basketball with her. I just loved talking to her she always made me laugh. We are so very sad she is gone. Our condolence to her loving family. We hope you find peace. IWe are so saddened over Jean's death. There are no words to express our sympathies. Our thoughts & prayers are with you all. Thinking of you at this very difficult time. Praying for God's comfort for all of you. Jean was a very special person and will be missed. God Bless You All. Jean Anne was an amazing lady with lots of talents. She will be missed by many. May your sorrow and pain be lightened as time goes by and with the help of others who love you all. My condolences to you and the family. Our deepest sympathy to all the families. You have all been through so much this past year and ask that God gives you comfort and peace and also know you have friends to turn to when you need them/us. Don't ever hesitate. We love ya . So very sorry to hear of your loss. She was a joy to be around and will greatly be missed. My thoughts and prayers are with you all. So sorry for your loss. Jean was my first boss right out of High School at Comp Management. My prayers are with you and your family.